Campaign Update – Town of Leesburg, Virginia responds. Home / Blog / Campaign Update – Town of Leesburg, Virginia responds. We have received a response on April 20, 2017, regarding our Sister City Campaign with the Samcheok, South Korea, and Town of Leesburg, Virginia. 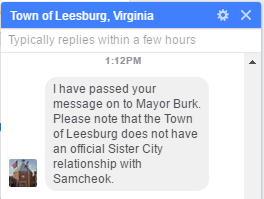 Official Facebook for the Town of Leesburg responded by stating that they do not have an official Sister City relationship with Samcheok. Our Sister City Campaign had been launched based upon information obtained from Governors Association of Korea and the homepage of Samcheok. With this confirmation given by Town of Leesburg, we will now close our Sister City Campaign, and online petition. We extend our gratitude to the leadership of Town of Leesburg, for responding to our petition so quickly. We also send our heartfelt thanks to all in support of our work, who have taken action to speak out against the cruelty to dogs and cats in the Samcheok. I would like to thank you and the Town of Leesburg for responding to our concerns raised via the recent petition on Change.org about the mistreatment, torture and consumption of companion animals in Samcheok, South Korea. And thank you for informing us that Leesburg does not have an official Sister City relationship with Samcheok. It is best not to be linked to a city which is notorious for their cruelty to companion animals. We have updated our supporters who have signed our petitions as well as our campaign page. I am so disgusted that any human could this. It makes me so sad to know what is being done to these sweet animals. I wish I could STOP them! Those people are ppainnEVIL!!! I will pray every day that our Father in heaven will STOP them!!! EN EL MUNDO COMPLETO NOS ABATE UNA GRAN TRISTEZA POR ESTA TERRIBLE CRUELDAD, ESTO ES IMPERDONABLE Y NO PODEMOS SEGUIR TOLERANDO TALES BRUTALES ACCIONES. ESTAS NOTICIAS SON AVASALLADORAS Y TENEMOS QUE CAMBIAR, QUE EVOLUCIONAR Y HACER UN MUNDO QUE DETENGA LA VIOLENCIA POR MEDIO DE LAS LEYES DETERMINANTES QUE DEN IGUALDAD ABSOLUTA A TODOS LOS ANIMALES. Sanctions and boycott should be promoted.